As the weather bureau predicts another wet weekend, the grandmother of a child crushed in a freak accident during a storm clean-up says the family are struggling to come to terms with how their "beautiful boy" wound up injured. The Sunshine Coast schoolboy, 11, was airlifted to Lady Cilento in an RACQ rescue LifeFlight helicopter from a property near Coolabunia in a critical condition. A Queensland Ambulance Service spokesperson said the patient suffered multiple injuries, including major trauma to his head, neck, legs and pelvis. The boy was playing in a hole, created by an uprooted tree, when the tree fell on to him yesterday as it was being cut up by a chainsaw, the Courier Mail has reported. His grandmother Karen Peek said the family was struggling to comprehend the situation yesterday, describing the events leading to Connor's injury as a "freak accident". "Once the (tree's) limbs were cut off, somehow, we don't know how, the tree flipped back up," she told the Courier Mail. Hail, flooding and severe weather across parts of the South Burnett. It comes after crazy hail in the same area and another incident when a mother desperately tried to save her baby daughter from serious injury. 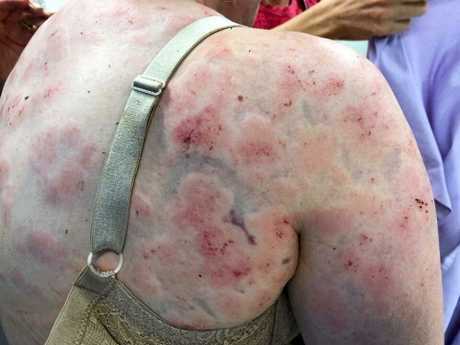 Fiona Simpson used her body as a shield after being caught in yesterday's hail storm. "There was no thought, I just did it, there was no fear... my seat-belt was off and I was getting in the back and there was no hesitation. Just survival instinct, like, when you are a mother you protect your child, no hesitation, you just do it." 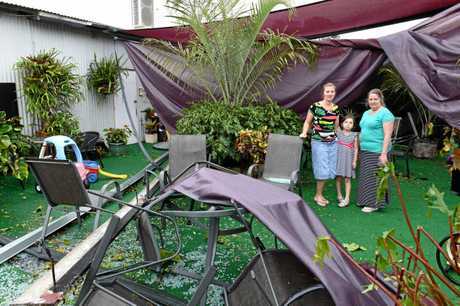 When they couldn't reach their property in time, a Fraser Coast family were forced to take shelter in their car as violent storms rolled through Maryborough West. Little did they know their retail shop Homewares from Everywhere was being battered by damaging winds that will now take months to repair. 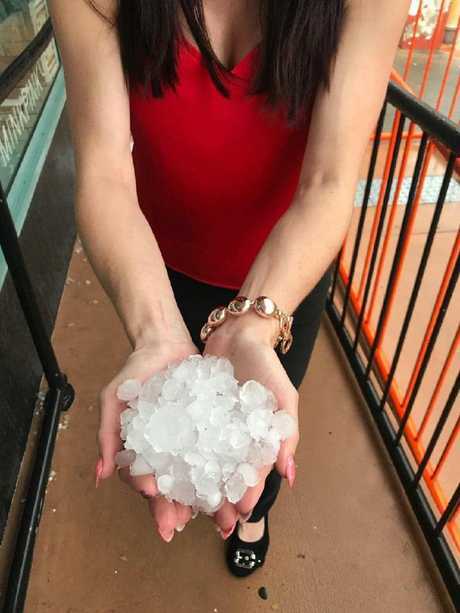 "It was terrifying, the hail sounded like gunshots and the kids were screaming in fear," Ms Pascoe said. Steve Miller was hoping to use the income from the harvest of his pineapple crops to pay for his upcoming wedding. But in a flash of rain, lightning and hail, his entire farm was destroyed. The manager of the Golden Pines farm in Yengarie was devastated to find thousands of pineapples and avocados, which he spent years planting and cultivating, destroyed in the tornado-like storm that decimated much of Maryborough West on Thursday. "We had the best crop of young avocados for the next season out there, and they're all gone," Mr Miller said. "That's a couple of hundred thousand dollars just gone. "And we have no crop insurance to cover it all." The Bureau of Meteorology still has active flood warnings for catchments between Gladstone and the Sunshine Coast. These warnings include the Dawson River catchment. Isolated flooding is expected in areas with localised rainfall, opening the possibility for continued or new road flooding. BOM is expecting the significant rain event to continue into today with possible thunderstorms. The heaviest rainfall is expected to begin across inland areas, including the Don, Dee and Upper Burnett River catchments and then extending further east to the coast today. Severe thunderstorms are likely to produce damaging winds north of Mackay, which is expected to impact fishermen. Locations which may be affected include Ayr, Mingela, Giru, Woodstock and Clare. Severe thunderstorms are no longer occurring in the Capricornia and Wide Bay and Burnett districts and the warnings for these districts have been cancelled by the bureau. Anybody on the coast should be aware of marine wind warnings for Fraser Island, the Sunshine Coast, Moreton Bay and Gold Coast areas for both Saturday and Sunday. Toowoomba residents are urged to prepare now for a weekend of wild weather as new figures reveal the city is the state's most storm-affected. As new data reveals more than one third of Queenslanders underestimate the damage storms can cause, NRMA Insurance revealed Toowoomba, Westbrook and Kearneys Spring were among the most storm-affected areas in the state. Rain will sit over the Northern Rivers and Mid North Coast and has the potential to cause river flooding from Sunday onwards. 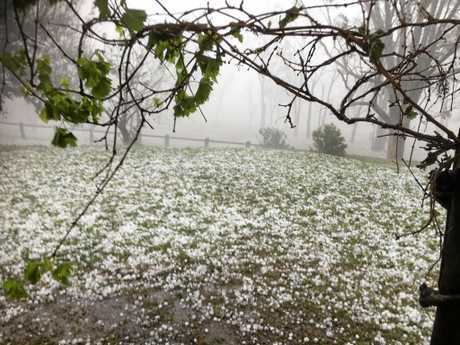 FARMERS across the Western Downs are picking up the pieces after an intense hailstorm ripped through the region on Thursday. Hail ranging from grape to golfball-sized pummelled properties, taking some producers back at square one. North of Chinchilla, watermelon grower Terry O'Leary had only one row left to plant before his crop was entirely wiped out by Thursday's ferocious storm, while neighbouring grower Tom Brett also suffered damage. "The storm came through and they'd been predicting it, and we just happened to be in the path and there was a small patch of heavy hail that happened to run across our property," Mr Brett said. 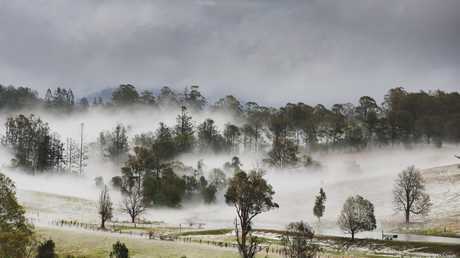 The hail hit a particular paddock, which Mr Brett said was becoming somewhat unlucky. "We have a (three-year) rotation and the last three times we've been in this paddock we've now had hail," he said. Gin Gin cane farmer Ronald Feierabend told the News-Mail his crops received significant damage. However, he was surprised more hadn't been caused by the "super cell". He said the hail was the biggest he'd seen in the past 40 years. "There was 10 minutes of non-stop hail, and it wasn't round hail - it was the block and about 7cm in size," he said. "I had 39mm of rain in 15 minutes, 67mm in total and there's about 5 inches of water around the house now. "It really was eerie last night, I've never been through such a thing." 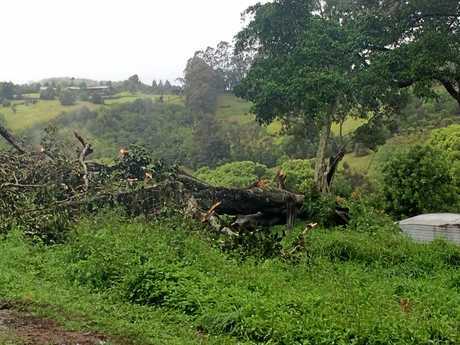 Gympie producers were also some of the hardest hit as the storm wreaked havoc, inundated properties and caused thousands of dollars worth of damage. 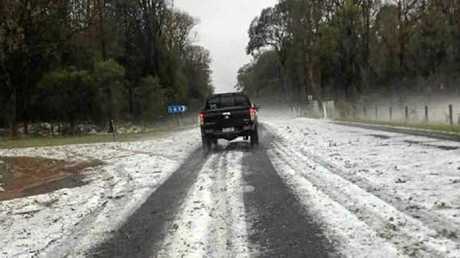 A Gympie resident with handfuls of hail. Kim and Jason Lewis of Cooloola Berries at Wolvi said they were "completely obliterated". "We've lost all our blueberries, the strawberries are all finished and it looks as though our lavenders are smashed to bits," Mrs Lewis said. "We've never experienced anything like this in the 12 years that we've been here." Pie Creek strawberry farmers Rick and Rosslyn Tramacchi said they had also lost their entire crop, but felt fortunate the storm had not come earlier in the season. 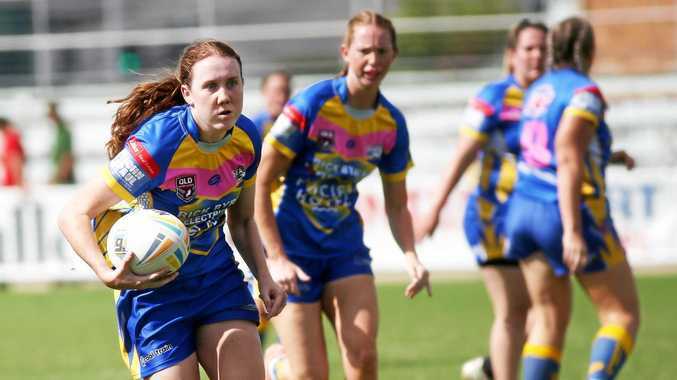 "We're not big enough for a fury like that," Mr Tramacchi said. "I've seen some storms but we've never heard or seen anything like that fury. "Lucky enough for us it didn't happen earlier, because it's nearly the end of our season, but we still lost all of it."